Dr. Eilert Eilertsen graduated from the University of Dundee in 1976, and opened his first practice in Dingwall in 1978. He has maintained a special interest in restorative dentistry and implantology since 1994. 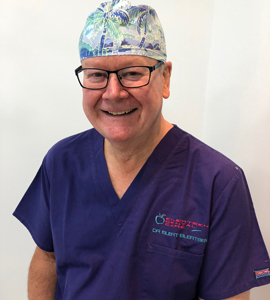 He carried out his training with Dr Hilt Tatum the originator of the sinus bone graft operation.He also trained with Dr Ashok Sethi one of the foremost implantologists in the UK. He has placed many thousands of dental implants so therefore has vast clinical experience and some of his patient testimonials can be read under the testimonial section.